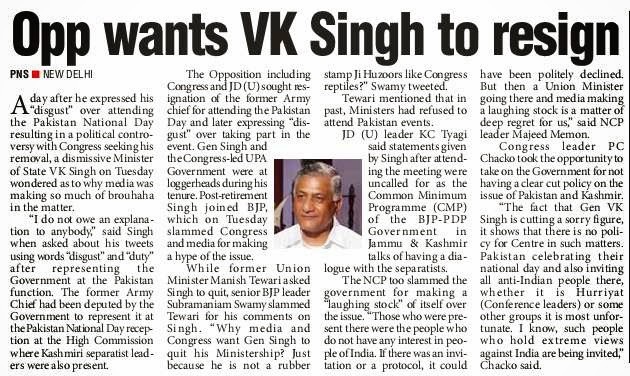 Former Army chief General VK Singh today rubbished TV reports quoting he had offered to resign after attending the Pakistan National Day celebrations yesterday. He said his tweets on “disgust” and “duty” had been misinterpreted. “I am aware of my responsibility and attended the function hosted by Pakistan High Commissioner Abdul Basit as a matter of protocol,” the Minister of State for External Affairs said. “When I took oath of office as a minister on May 26, 2014, I knew my responsibilities and the duties that came with the post," he said. Some TV channels had been running debates on the Narendra Modi government’s decision to send a minister to the function even as Basit met Hurriyat leaders and invited them for the celebrations last evening. Some former service officers were also critical of the government’s move. 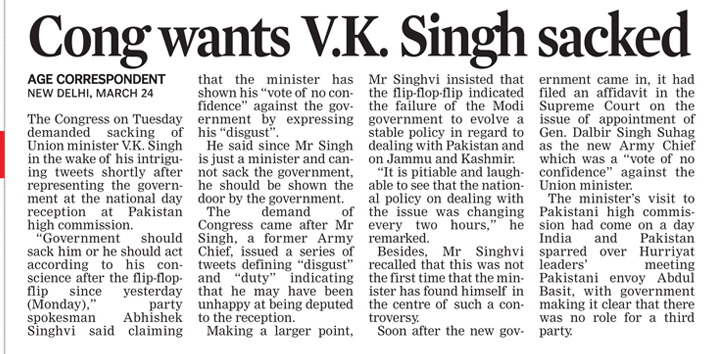 The Congress also demanded Singh’s resignation. “The government should sack him or he should resign on the call of his conscience after his flip-flops yesterday,” Congress spokesperson Abhishek Singhvi said. The Congress also attacked the BJP government for “failing” to evolve a comprehensive policy in respect of India and Pakistan relations and said the Centre’s policy was changing every two hours. Explaining the need to have a comprehensive national security policy Lt Gen SS Mehta (retd) listed water, energy, food security, access to technology, climate change, education not being linked to employment and gender issues as aspects that could affect national security that is very different from national defence. Lt Gen Mehta, a former GoC-in-C of the Chandimandir-based Western Command of the Indian Army, was delivering the fourth annual K Subrahmanyam memorial lecture on the theme: "Securing India's insecurity: Emerging vulnerabilities in an interconnected world", this evening. Subrahmanyam is considered a doyen among Indian strategic thinkers. Former Minister of State in the External Affairs Ministry Shashi Tharoor chaired the talk, while S Jaishankar, Foreign Secretary and son of Subrahmanyam, addressed the audience. Lt Gen Mehta said it was important to comprehensively reform the country's higher defence management recommended by K Subrahmanyam. "This means not just appointing a single point military adviser to the government (by way of Chief of Combined Defence Services) but also setting up unified theatre commands," he said. A single point military adviser to the government should be backed by theatre commands. "The theatre commands could be specific to regions such as the Eastern Naval Command or to areas such as the Army's Northern Command in which other service elements must be integrated," he said. 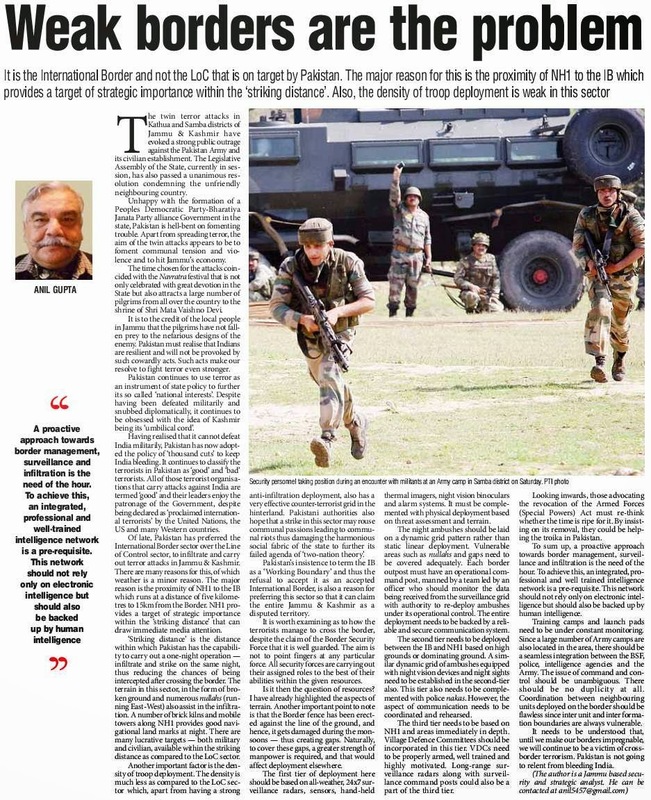 The government has hinted at integration of the three Services and a mechanism for creation of a post of CDS, but Lt Gen Mehta cautioned that this should not end up like the present system of a rotating Chairman of Chiefs of Staff Committee with the bureaucracy as an arbitrator or like the Headquarters of the Integrated Defence Staff (IDS) which is only attached to the Ministry of Defence. Explaining the concepts of national security and defence, he said, the fast-changing landscape, the rise of new vulnerabilities as well as interconnections, the power shifts all demand a clear comprehension about the two concepts. Comprehensive national security includes political and military, economic security, soft and hard power, focused development and growth of human and material resources along with public understanding and support. The standard notion of national defence conventionally relates to maintaining sovereignty and territorial integrity; ability to control internal disorder; reacting to man-made and natural calamities; possessing the political competence to weigh options and display the capability to meet international obligations. To secure the country's future and remove insecurities of every citizen of India, we must continue repudiating some Western constructs such as Samuel Huntington's prognosis about the shift in conflict from nations to cultures. This aspect has also been stressed by the sagacious strategic thinker and Subrahmanyam's illustrious peer Henry Kissinger, a former US Secretary of State. Lt Gen Mehta pointed that Subrahmanyam was especially critical of successive governments' antipathy to long-term strategic planning and absence of specialised positions and resources. He said we would be perpetuating Subrahmanyam's iconic and tireless lead in making our country safer by a comprehensive and flexible national security outlook reflecting all national security concerns and providing an actionable blueprint for tackling them. Lt Gen Mehta also wanted better utilisation of existing resources in the defence sector such as the trained, disciplined and still physically fit 70,000 service personnel retiring every year. India and China underscored the importance of taking measures to maintain peace and tranquillity in the border areas emphasising it as a pre-requisite for continued growth of bilateral relations while deciding to expand contacts between border forces. 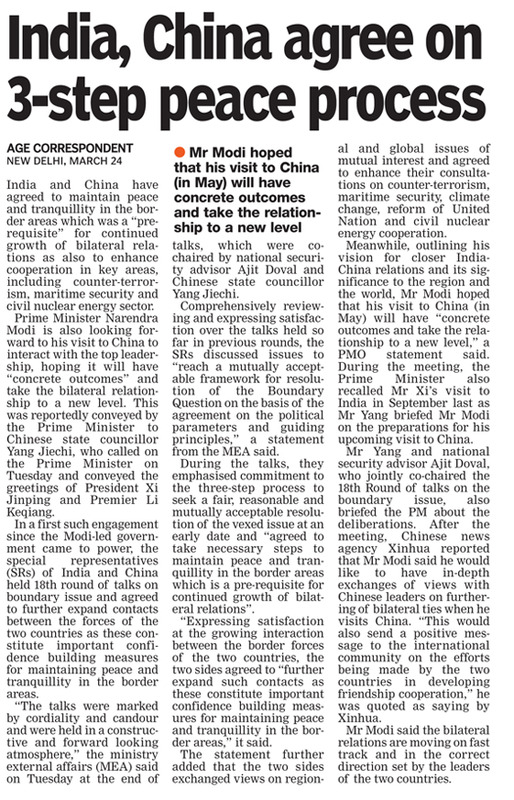 The iteration came at the end of the first-ever boundary talks under the Modi Government between the Special Representatives (SR) of India Ajit Doval and Yang Jeichi of China held here on Monday. The State Councillor Yang today called on Prime Minister Narendra Modi and conveyed greetings of President Xi Jinping and Premier Li Keqiang. Prime Minister Modi is expected to visit China before the end of his first year in office this May. Both sides also utilised the opportunity to exchange views on regional and global issues of mutual interest and agreed to enhance their consultations on counter-terrorism, maritime security, climate change, reform of United Nation and civil nuclear energy cooperation, the last two being of special significance to India. "Both the sides agreed to take necessary steps to maintain peace and tranquillity in the border areas which is a pre-requisite for continued growth of bilateral relations. The Special Representatives expressed satisfaction at the growing interaction between the border forces of the two countries and agreed to further expand such contacts as these constitute important confidence building measures for maintaining peace and tranquillity in the border areas," the Ministry of External Affairs said in a statement here today. Both Doval and Yang undertook a comprehensive review of earlier rounds of the talks, expressed satisfaction on the progress made in the negotiations and emphasised commitment to the three-step process to seek a "fair, reasonable and mutually acceptable resolution of the border question at an early date". "I want to emphasise that the early settlement of the boundary question is in the fundamental interest of the two countries. It is also an effective way to remove obstacles getting in the way of bilateral ties," a PTI report from Beijing quoted Chinese Foreign Ministry spokesperson Hua Chunying stating this in response to question about progress of the talk adding that the boundary question was a problem left over from history. 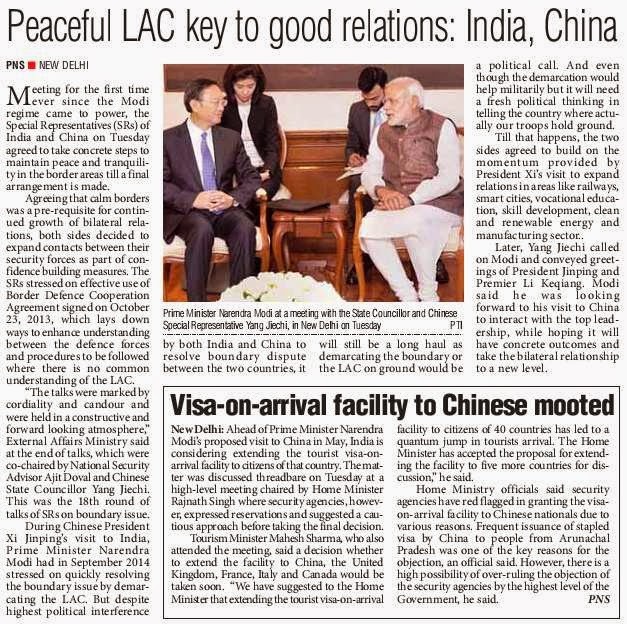 The visit of Yang to India for the 18th round of talks on the boundary issue is under the mechanism evolved during Prime Minister Atal Bihari Vajpayee's visit to China in 2003 to sort out the dispute over 4000-km Line of Actual Control (LAC). Beijing maintains that the dispute is restricted to 2000 km, essentially Arunachal Pradesh in the eastern sector which it claims as part of southern Tibet while New Delhi asserts it covers the western sector, including Aksi Chin occupied by China during the 1962 war. The two sides agreed to build on the momentum provided by President Xi Jinping's September 2014 visit to further expand bilateral relations in areas such as railways, smart cities, vocational education, skill development, clean and renewable energy and manufacturing sector. During the visit of Prime Minister Manmohan Singh to Beijing in 2013, India and China signed agreements relating to border, including hotlines between military commanders, sharing data on trans-border rivers besides establishing sister-city partnership between Delhi-Beijing, Kolkata-Kunming and Bangalore-Chengdu. Pakistan High Commissioner Abdul Basit today continued holding consultations for the third consecutive day with separatist leaders from Jammu and Kashmir during which he sought their help for building an environment of peace in the subcontinent. The first delegation was led by former chairman of the moderate faction of the Hurriyat Conference Abdul Gani Bhat which was followed by a team of hardline Hurriyat led by Syed Ali Shah Geelani. After his hour-long meeting, Bhat said it was important for peace in India and Pakistan that there should be friendship between two countries. “We are with any such move that forges a new era of friendship between the two neighbours. We have to understand that dialogue is the only way to move forward,” Bhat said. A professor of Persian, Bhat said every Indian and Pakistani citizen was in favour of friendship between the two countries as this would not only benefit the region, but also the world. 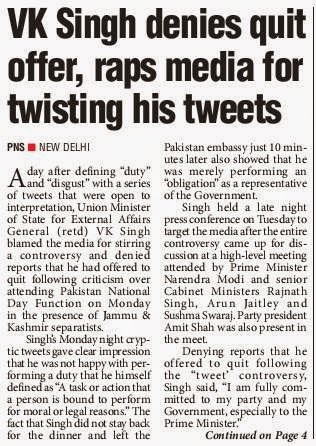 The media criticism of Minister of State for External Affairs VK Singh’s presence at the Pakistan High Commission reception yesterday has no basis, Bhat said and advised the media to contribute to peace rather than become an obstacle. Moderate Hurriyat Conference chairman Mirwaiz Umar Farooq, who held a separate one-to-one meeting with Basit on Sunday, also said the speculation in the media should not be given importance. 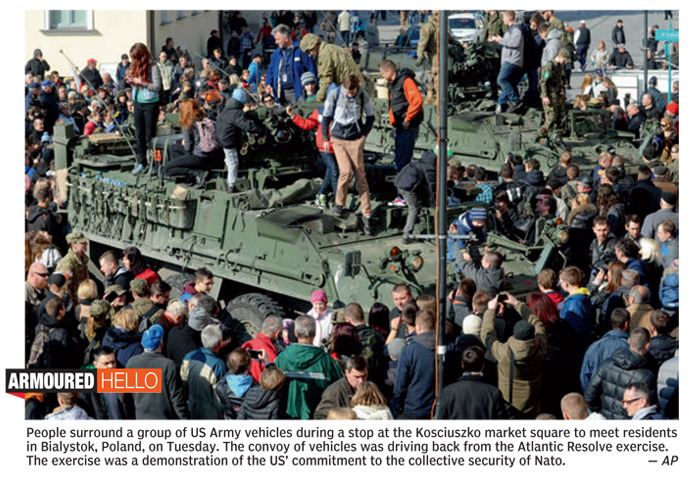 “The matter is whether there is a political will between the two countries to go together. The media cannot take the government hostage, it cannot make the situation of Kashmir or Kashmir policy a hostage,” Mirwaiz said. 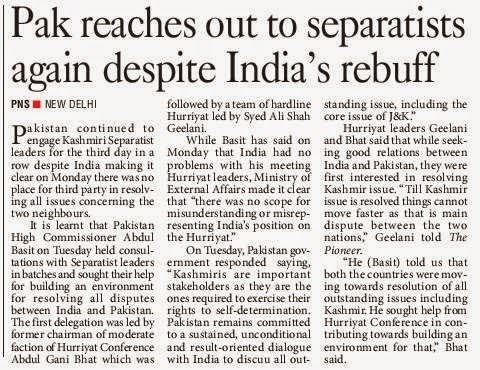 As for the Hurriyat Conference, it is also a constituent and representing an opinion of people of Kashmir and “we will be happy talking to India as well as Pakistan”. “When the two sovereign nations will sit across the table, all issues including Kashmir, will go together. In case any country shies away from the Kashmir issue, we may be talking peace but we don’t mean peace then,” said Mirwaiz. BSF personnel in the Great Rann of Kutch (Gujarat) have another adversary -- besides the enemy across the border -- to contend with: Snakes and scorpions. Unlike their colleagues in Jammu and Kashmir who face militants' bullets, or the ones at the Indo-Bangladesh border who are kept on their toes by the security situation there, or their brethren in states affected by Left-wing extremism, the brave men in the Great Rann of Kutch also run the risk of losing their lives to snake and scorpion bites. During a visit there in the first week of March, sources in the BSF told The Tribune that at least three cases of snake and scorpion bites are reported every month in the region. The land areas of six creeks -- Kori, Padala, the disputed Sir Creek, Pabewari, Pir Sanai and Vianbari -- along the border are “infested” with snakes and scorpions. Other regions where bites have been reported include Lakhpat, Vighokot and the Harami Nullah. Harami Nullah is a channel in the Vianbari Creek, which enters Pakistan through the G-pillar line of the border and re-enters India at Border Pillar 1170. An officer posted in the Rann of Kutch said: “It is the scorpions that you have to watch out for. They get inside your boots. Even if you bang your boots as a precaution, a scorpion may still remain inside -- as it may stick to the boot insides. When you put on the boots, it may sting you." During a visit to the region in June 2013, the previous Inspector-General of the Gujarat Frontier, AK Sinha, had said that there were numerous cases of snake bites in the Rann and Creek areas. “In the Vighokot area, one of our personnel was bitten seven times by a snake. He was airlifted and given 100 anti-venom shots here in Gandhinagar. 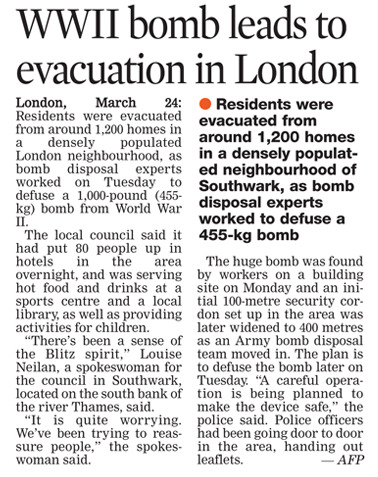 This happened in October 2012,” Sinha had said. An officer of the BSF’s medical cadre said that the snakes that are found in the Rann area are vipers. “When a snake bite happens, we first give first aid. But that only delays the spread of the poison. We necessarily have to give anti-snake venom,” he said. IG Mehra said that every border outpost in the snake-infested regions keeps a supply of anti-snake venom. “Our men are sensitised on a regular basis. Ambulances are positioned at strategic locations. In case of snake and scorpion bites, the person is evacuated to the nearest medical outpost. 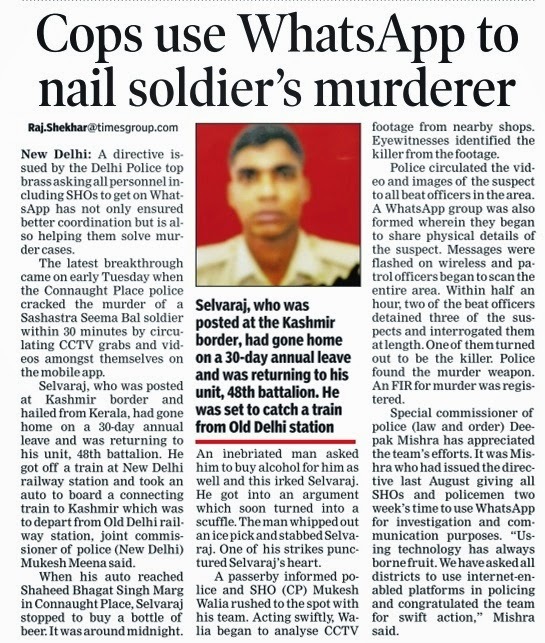 I cannot recall any incident in the last couple of years in which a BSF personnel died due to scorpion or snake bite,” he said. An officer posted in the Rann area said that BSF men might be able to lessen bites, especially during the night, by “wearing boots while going to the bathroom” and “carrying torches”. During floods, the problem assumes a keener edge as there is no way a victim can be evacuated by land or air. At certain times of the year, the Vigokot area gets flooded by water released from the Left Bank Outfall Drain (LBOD) in Sindh, Pakistan. At those times, the only road -- about 100-km long -- from the border in the Vigokot area to the nearest town, Khavda, gets flooded. The BSF does not have its own helicopter on the Gujarat frontier. The one they had had crashed in Sirohi, Rajasthan, due to technical issues five years ago. 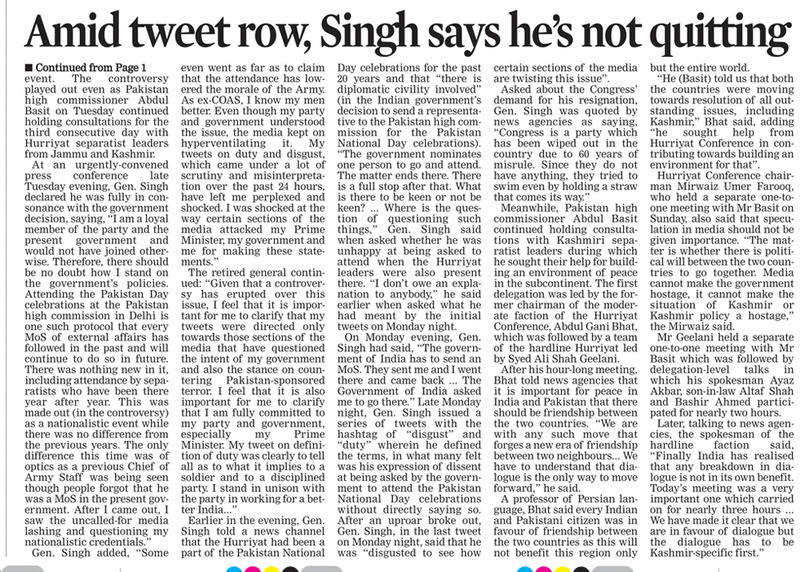 The Damage Done by Gen Singh's Tweets on "Disgust"
Diplomacy requires many qualities, but perhaps the most important is that of putting the national cause before yourself. The old saw that a diplomat is an honest man sent abroad to lie for his country is based on a recognition of this simple fact. The service of the national interest may oblige a diplomat to suppress his own beliefs, even sacrifice his own principles, in order to do his job effectively. Lying is part of it: since diplomacy requires you to deal with many who do not have your best interests at heart, it requires you to lie pleasantly to people you privately despise. The best example of what this can involve came from a non-diplomat, Lilian Carter, President Jimmy Carter's mother, who said that her son was an honest man who was obliged to tell "white lies" that harmed no one. Challenged by an aggressive journalist to give an example of such an acceptable lie, the indomitable Mrs Carter replied sweetly, "When you came in, I said I was pleased to see you!" 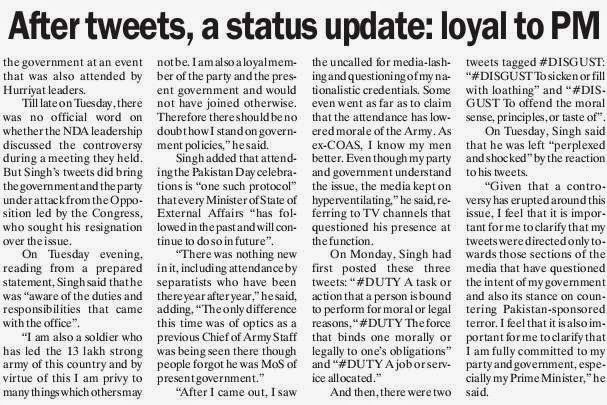 General VK Singh is no diplomat, but as an army man he comes from a similar tradition of putting the national interest before one's own. After all, soldiers are trained to sacrifice their lives, if necessary, in the service of the nation: what is mere insincerity compared to that? As Minister of State for External Affairs, he is now the country's second ranked diplomat, and he has already had to feign interest in people he had never heard of, representing countries he had never been to. He has had to make small talk and deliver ritual speeches; wining and dining is part of the job description, even if it sometimes descends into whining and signing. One of his unavoidable tasks in the job (one in which I preceded him six years ago) is to represent the Government at diplomatic events, especially National Days, that dreaded annual ritual of celebration when Ambassadors blow a large portion of their hospitality budget in trying to impress fellow diplomats and local grandees of the importance and munificence of the country they represent. One arrives at a pre-scripted time, shakes hands and chats politely, stands stiffly to attention for both countries' national anthems, shakes hands, poses for photographs, eats some of what the host offers and sometimes says a few banal words about friendship and goodwill. I've done it a dozen times. In diplomacy, this is about as routine and procedural as it gets. But the bluff solider who uncomfortably occupies my old office in South Block has managed to make a monumental mountain out of this diplomatic molehill. Assigned the job of representing India at The Pakistan High Commissioner's National Day reception, our doughty MoS donned a green jacket in presumed deference to his hosts' Islamic fondness for that colour. 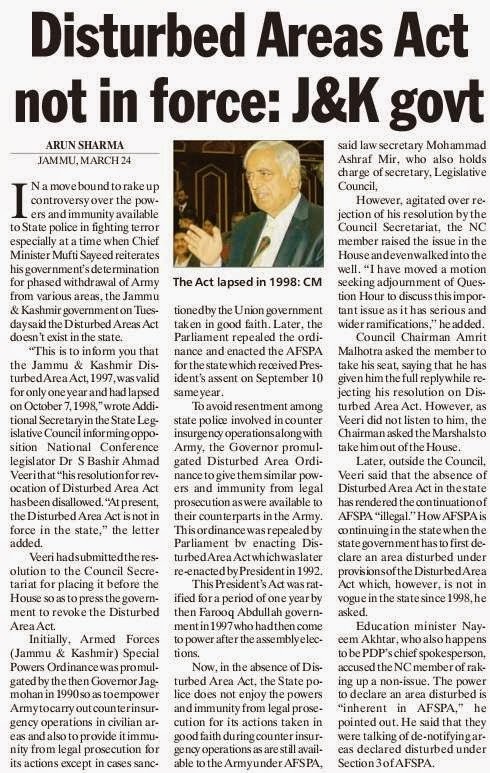 He then attended the reception according to the pre-scripted formula, knowing full well, since it was openly announced, that Kashmiri separatist members of the Hurriyat would be in attendance (As citizens of a free and democratic India, they are free to attend any party they are invited to, just as they are free to form any party they want to.) It is not known whether he said hello to any of them (some years ago I was indeed introduced to Syed Ahmed Shah Geelani at the same event by the then Pakistani High Commissioner Shahid Malik, and greeted him politely before moving on). But if he did, he was just doing his job. That would, in the normal course, have been that, except that General Singh apparently decided that he needed to distance himself from his own official actions. Taken aback, perhaps, by a few irresponsible media comments about his attendance, he felt he needed to convey to the Indian public that he was only doing his job, and not very happily at that. 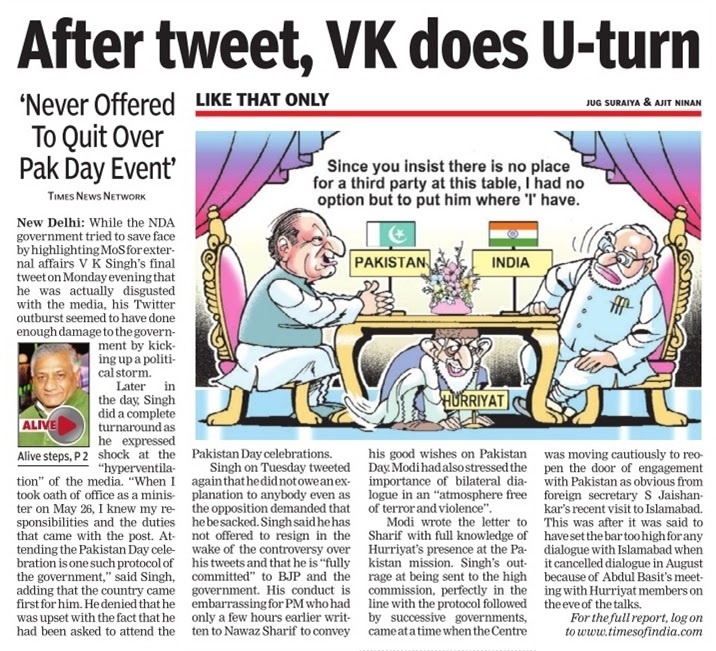 After he had left the reception, having done his duty to Indian diplomacy, he proceeded to undo his own contribution to Indo-Pakistani relations by issuing a series of bizarre tweets conveying his "disgust" at what he had to do in the cause of "duty". This was having the worst of both worlds. A diplomat is someone who tells you to go to hell in words that make you look forward to the trip. He doesn't undermine the impact of his pleasant words by explaining loudly to others that he really wants you to burn in eternal damnation. Twitter is a particularly seductive medium for setting the record straight, because it reaches the media as well as the general public. Unfortunately, it also tells the person you were insincerely nice to that you really didn't mean it. That defeats the whole point of the effort you made in the first place. The damage done by the tweets has to be seen in the context of what the Modi government seems to be doing on the Indo-Pak front. It has stretched out a conciliatory hand, sent the Foreign Secretary to Islamabad, downplayed the terrorist attacks a few days ago in Jammu and Kashmir, and the Prime Minister used the occasion of Pakistan's National Day yesterday to declare his new-found faith in peace and dialogue with our most hostile neighbours. 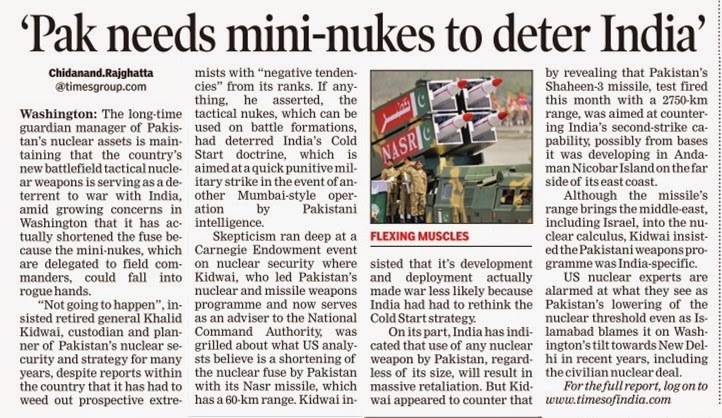 If this is all part of a carefully calibrated opening to Islamabad, the last thing the Government of India needs is for one of its own servants, an instrument of its policy, to undercut the policy he is supposed to help execute. General Singh is a good man doing a bad job -- mainly because he's in the wrong one. His nature, as he has demonstrated in his army days, is to be blunt, direct, aggressive and confrontational when he deems it necessary, even to the point of suing his own Government while in its service. These are fine qualities for a BJP politician. They are just not what the country needs in a Minister of State for External Affairs. 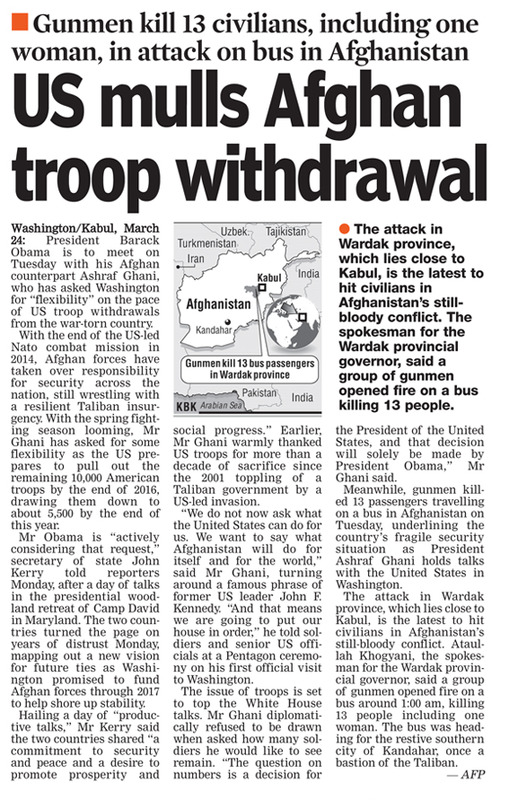 There is probably no more important issue on our diplomatic agenda than relations with Pakistan. They are thorny, tangled, frustrating, full of pitfalls, betrayals, deceit and treachery, but also of immense potential for ensuring peace and prosperity for our own people. They need to be handled with finesse, subtlety, and yes, sometimes with insincerity. Pakistan is not the right place for a bull who carries his own china shop around with him. There's an old line about diplomacy that says: "If he says yes, he means maybe; if he says maybe, he means no; if he says no, he's no diplomat." 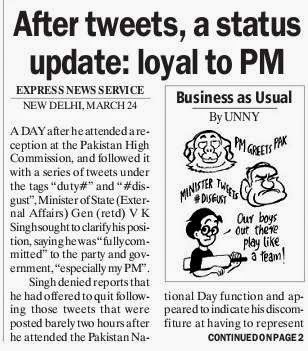 Gen VK Singh, whom I genuinely like as a person, is no diplomat. If the Prime Minister is serious about his diplomatic opening to Pakistan, he needs to harness General Singh's considerable professional qualities for something more appropriately up his street - a job in which he can say "No". Give him the Swachh Bharat Abhiyan or the bullet train project, and let his office in South Block be occupied by someone who understands the difference " between calling someone a liar and pointing out gently that he may have inadvertently been guilty of terminological inexactitude. The basic features of the MoU are the same as before. Some additional features which have been further improved from before are Personal Accident Death Cover which has been linked to Defence Salary Package account and over draft of upto Rs One Lakh. In addition, all facilities of the MoU are also available to the pensioners, including overdraft and 'Personal Accident Insurance', irrespective of any age restrictions.